Lets face it, Halloween is probably not our pets favorite holiday. We force them to wear silly costumes, parade around the neighborhood looking ridiculous and being tempted by treats that are potentially deadly to them. I am sure it ranks right up there with all the New Years and 4th of July fireworks. 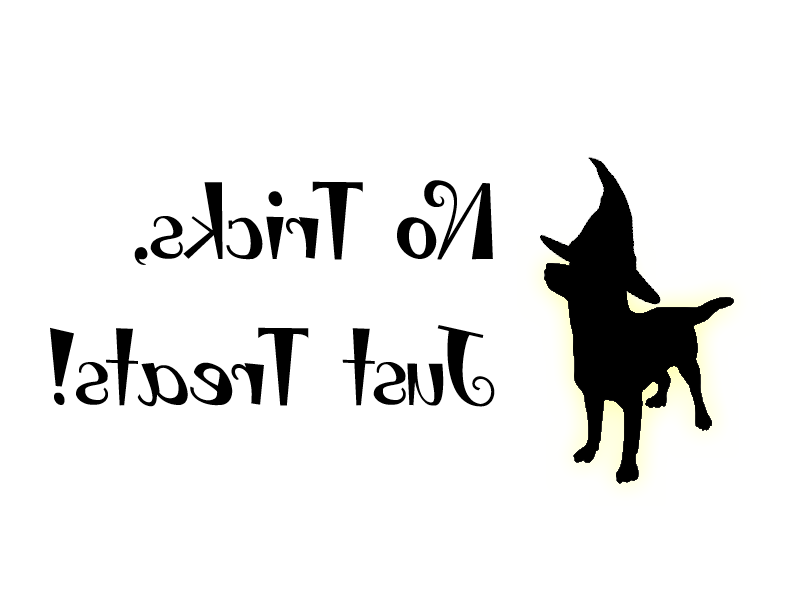 So, with all this bad press we are giving Halloween lets make this day a little better for our 4 legged friends. 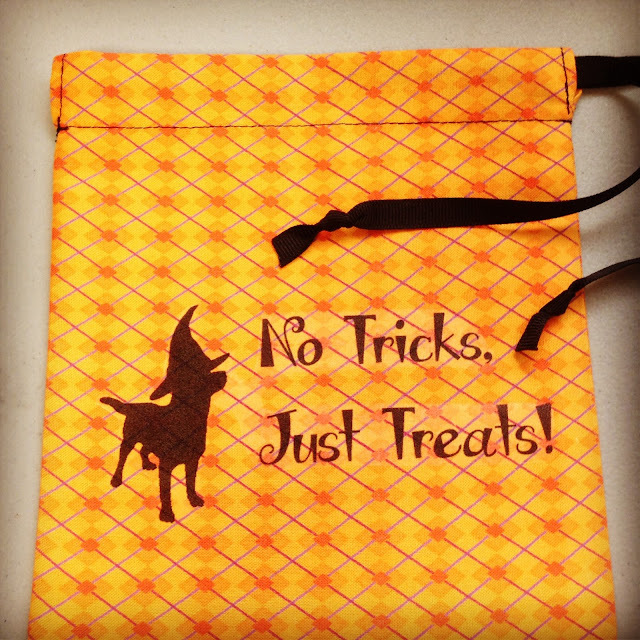 I made a few of these bags to hand out to our 4 legged trick-or treaters this year. The bags are super cute and the best part is they are filled with yummy dog treats! 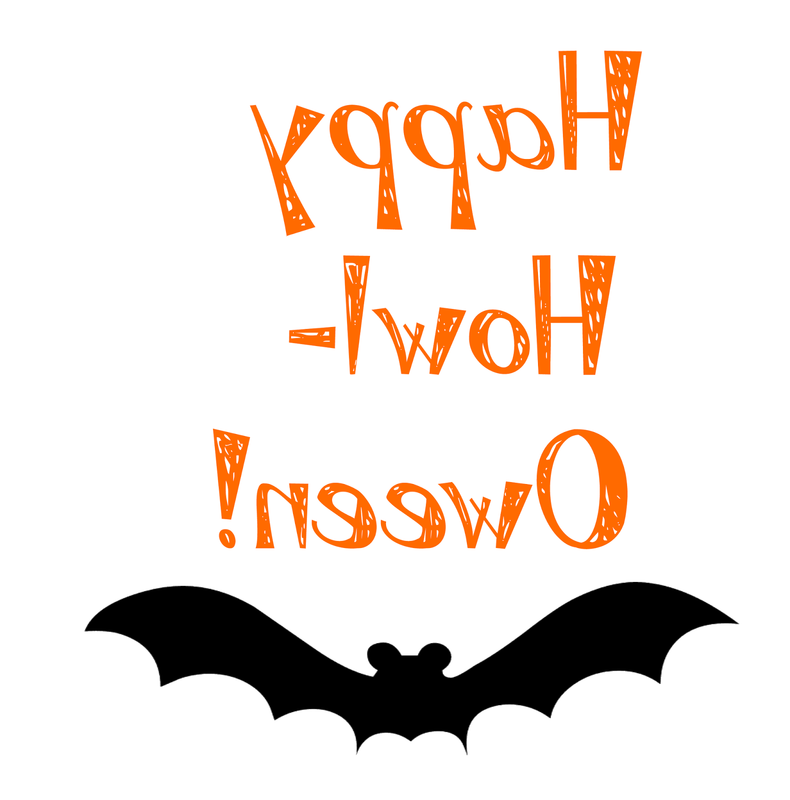 Here is a tutorial so you can make our own bags for your 4 legged Trick-or-Treaters. First, you want to select your fabric. I had some scrap fabric around and decided to make the most of it. Just keep in mind you will want your iron on image to stand out against the fabric. Next, You will want to sew your raw edges at the top of your bag. Turn in each edge and make a simple hem on all 4 pieces. You can skip this step if you like but it will make your bag look nicer and more "finished." Next you are going to make a fold over at the top that will allow for the drawstring closure. Keeping your bag inside out, fold over the top and pin it all the way around. Then sew around the bottom of the fold. Make sure you allow for enough space to run a ribbon for your drawstring. Then flip it right side out and check out your handy work! Next, you will want to run your ribbon through your bag. If you have a threader you can use it now otherwise get a safety pin and pin it to the end of your ribbon. This will help you run your ribbon through the bag. OK, now you will want to run a warm iron over your bag and then move to your printer. You can create your own image or use either of the two I have created for you. It is always a good idea to print on a piece of paper first to make sure it will fit onto your bag. Also, Make sure your image prints backward so it irons on correctly. Once you have everything fitted go ahead and print out your image onto your iron on paper. Then carefully cut it out as close to the image as possible. Follow the instructions that came with your iron on paper and iron on your image. Once the iron on paper has cooled carefully peel off the paper and you will see your masterpiece! Now that your bag is complete you can fill it with homemade treats or store bought ones. I filled my bag with dehydrated Sweet Potato Chips for our allergy conscious friends. I hope you enjoyed our little tutorial!